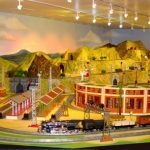 California State Railroad Museum – SMARTT: Scale Models, Arts, & Technologies, inc. The Thomas Sefton Collection is a multi-million dollar exhibit of classic pre-WW2 trains and accessories, with this layout as its centerpiece. Conceived as an educational look at beloved toys from yesteryear, the collection includes some rare and wonderful toy train artifacts from that era, many of which are displayed on the layout itself. With all the wonders in this restored museum, this nostalgic interactive display is a central draw to the museum for kids of all ages. Each of the four independent main lines is activated by a button on a podium outside the display that the visitors push sending replicas of the classic locomotives whizzing around the layout, their tin-plate rolling stock happily clanking along behind them. After a preset period, the trains pull to a halt allowing the next visitor to start the process over again. Some of the rarer static artifacts are highlighted by special LED spotlights activated by more push-buttons on the podium next to a description of the object. This helps visitors pick out and learn more about these wonderful toys. Interactive push-button spotlights highlight specific items described on educational kiosk.